There comes a certain amount of pressure when your address is No.1 Savile Row, but pressure is what Gieves & Hawkes thrives upon, as does the storied house's clientele. With roots firmly planted in military tailoring tradition, Gieves & Hawkes has attired military personnel with exquisite uniform for 245 years. You may only do battle in the global financial markets or on the commute to the office, but even that demands coats of sartorial armour and so this season its Creative Director, John Harrison, has reinterpreted Gieves & Hawkes' long-standing naval heritage for the international man. Classic British dress codes and many of the house’s forgotten signatures have been reintroduced with a modern sensibility to create a collection that is both forward-looking and relevant for discerning rakes today. Gieves & Hawkes has, in fact, been the chosen outfitter to the British Navy’s officer class since the mid-1900s and so Harrison spent time immersed in the archives, uncovering long forgotten parts of the house’s naval history. Freshly discovered signature motifs, such as the octopus (which is a symbol often found on naval paraphernalia including Victorian mess jugs held in the Gieves & Hawkes archive), and the 1772 Crown Ship monogram, an emblem first gifted to Robert Gieve by the British Navy, have been reinstated into this eclectic winter collection, which brings to the fore the house's structured silhouette, replete with square notched lapels wide enough to take full repeats of checked fabrics. Suits feature a longer line through the body and sharp pocket flaps for a clearly defined, masculine look that will speak volumes in the office. Smart casual jackets feature a slightly softer construction for the weekends, including subtly textured cloths or soft-knitted wool blazer fabrics. 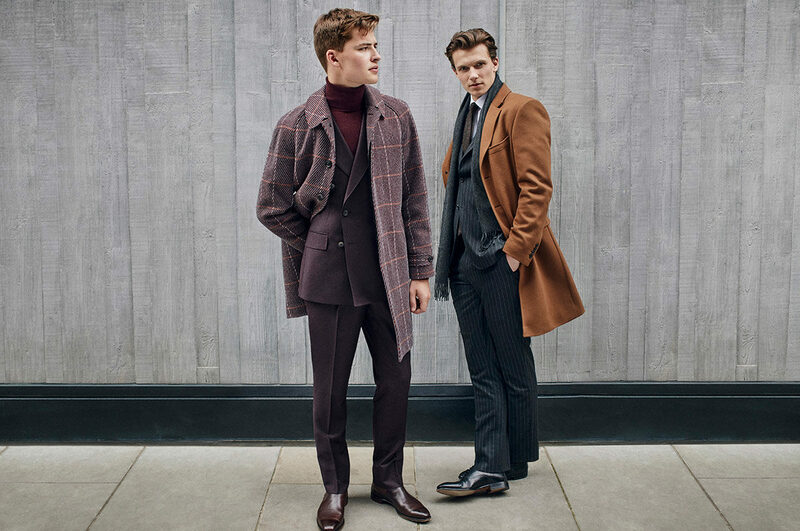 Gieves & Hawkes' weekendwear for AW18 has been created from the same blueprint, notably with two iterations of the iconic peacoat; one in navy and cream shearling with a generous revere collar, and the other a modern design in lambswool melton. New for the season, a Sou’wester coat, has been cut in a rainproof technical cloth with impressive proportions and a naval-inspired panelled front that will weather out the most inclement conditions with stylish aplomb. Even the classic raincoats have been bonded and seam-sealed for enhanced functionality. Pair this luxurious yet extremely functional outerwear with Gieves & Hawkes' fine-gauge knits in cashmere, silk and merino blends, checked cotton flannel shirts, and chunky cream Guernsey for an enviably tactile aesthetic. The colour palette, while informed by Gieves & Hawkes’s naval heritage, is nevertheless eclectic: alongside midnight and English navy sit rich ginger, tobacco and ochre colours, as well as cream, grey tones and oxblood. Although textures are soft and utilise woollen flannels and tonal checked fabrics suited to sophisticated business use and smart-casual dress codes, all the house’s jackets now feature either half or full floating canvas construction and improved sleeve setting, creating a perfect balance between comfort and practical formality.